Ahem. Every week I think this show can't get any cuter, but every week there's some sparkly new treat to gush over, and this time it was my biggest weakness: cute widdle aminals. Of course, there was also the usual murder, backstabbing, and snarky comments from Emerson perverting that adorableness into something interesting. Scratch that, something disturbing. I never realize until I go back over my notes for each episode how fucked up this show is. Let's review. -Chuck/Olive peeling off her skin in Ned's dream. -Murdered dog breeder impaling himself several times on a pointy dog brush. -Said breeder having four wives, each with an incentive to kill him, as well as four corresponding dogs that he combined into one uber-puppy, the Col-a-dor-russel-apoo. -One of said wives faking said uber-puppy's death to keep it from being sold to–wait for it–a big-time puppy-making corporation. -Puppy svengali planning to clone uber-puppy from supposedly dead dog's ashes–ashes that actually belong to dead rat. -Emerson unwittingly getting click-trained by the dog-trainer wife, who later knocks him out and restrains him with a squeaky toy ball-gag, an experience that reminded him of being locked in a washing machine for two days when he was a child. The shiny veneer that initially obscures all this weirdness actually amplifies it upon closer inspection. There's the immediate gratification of a multi-tiered story and some good solid laughs, but then a secondary appraisal generally brings about feelings of "Holy hell, what did I just watch? And why did I like it so much?" Last week's and this week's episodes epitomized that dichotomy (and I love it). The Ned-Chuck-Olive triangle got a little more twisted as well this week. It was only a matter of time before Ned's attraction to Chuck reached the level that even the most vigorous of prophylactic rubbing couldn't satisfy. His kiss with Olive last week, combined with the idea of polygamy being on the table this week, provided a tempting second option. As Emerson put it, "one to have, one to hold." Of course, the awkward, cherry-cheeked piemaker would never dream of acting on such an idea, but the fact that both he and Chuck acknowledged the possibility shows that their relationship isn't as warm and fuzzy as their puppy-dog eyes and sweet nothings make it seem. While things continue to shape up nicely in the present day, I think it's about time to nix the flashbacks. I (unlike quite a few of you) don't mind the narration, but it's gotten to the point that when I hear Jim Dale utter the words "young Ned" I zone out. How many times must we see little Neddy and his bowl-cut gazing sadly into the distance to understand that he was a sad, special little boy who turned into a sad, special man, and it's all very sad and special? Every freakin' week, apparently. Initially the flashbacks were helpful, explaining some of the ins and outs of Ned's gift; but the weekly jaunt through childhood-trauma land is getting a little tedious. That time would be much better spent checking in on the aunts, who were sadly absent from this episode, or perhaps for another musical number (next week!). But I really don't think the flashbacks are going anywhere; they've become one of the show's signifiers, along with the "the facts are these" exposition and that odd cadence employed by the actors when they speak (slow, reallyreallyfast, slow again). Hopefully they'll continue to be as pared down as tonight's was, though. But Pushing Daisies might not have many more weeks of flashbacks, or anything else for that matter, ahead of it: Prior to the writer's strike, Bryan Fuller re-jiggered episode nine to work as a season (series?) finale. While I admire his foresight, the prospect of a truncated season (or worse yet, yet another short-lived quality series) is disappointing. At any rate, fans of the series should relish the next three episodes, as there's a good chance they'll be the last taste we get. -Who knew cloning dogs was so easy? If this blogging thing doesn't pan out, I'm gonna get me a puppy factory. -So are extended opening sequences pretty much extinct now? 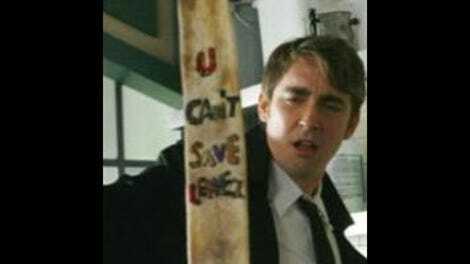 It seems like almost every new series is just using a title card, including Pushing Daisies. If any show deserves a theatrical opening, it's this one, but no, not even a damn theme song–just a few chimes. Seems like a waste. -I may be revealing my ignorance of criminology here, but do people really still offer rewards for solving murders? Isn't that what the police are for? -Once again, the line-of-the-night award goes to Emerson: "I suppose I could pay my bills with blind kids' smiles, but their money is a lot easier." -Tonight's pie: Lemon (yum) meringue (yuck).